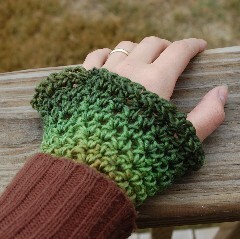 As cold weather set in, I found myself wishing for a pair of wristwarmers to wear while I typed. Unfortunately, it seemed that all the patterns I could find were boxy and rectangular. I wanted something girly, with a little flair! The gentle bell-shape of these wristwarmers is sure to please, plus it's easy to achieve with the help of some very simple directions.